When you first login, your Contact list will be empty. 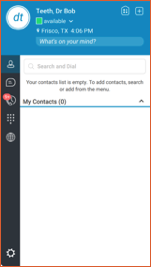 By adding contacts, you can quickly see their status, call them or have a quick chat with them. To add contacts, click the directory icon on the left side, and the list will change to a directory listing of all numbers or users in your company. 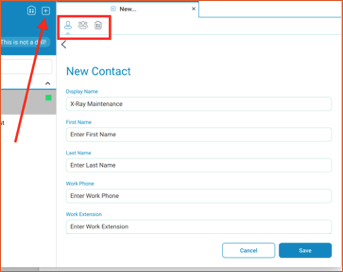 To add someone as a contact, control-click or right-click on that contact and choose Add to Contacts. You can also add contacts that are not in the company directory. To add a new contact, click the + sign in the profile box. A new tab will expand letting you create a new contact for anyone you call frequently. External contacts you add will not show presence information.